Every sponsor has basic information such as a name, a head quarter country and a sector. The first two play absolutely no role game play wise, but the sector can be used to your advantage. The sector implies in which sector the sponsor is active. If you have no other sponsor that has this sector, then you can offer the sponsor to be the exclusive sponsor for this sector. This gives your negotiations a slight boost, and will make your offer more attractive. Sponsors are categorized in 5 rankings called sections. The sponsors from section 5 are only interested in a section 5 spot on your car. Section 4 sponsors are only interested in a section 4 spot or higher. You can always offer an additional lower spot than the minimum that they want, in order to make your offer more appealing. The higher the section, the more points you will need to sign the sponsors to the team. Depending on how wealthy the sponsor is, they will offer more money to the team. The sponsor's wealth is expressed in stars with a minimum of 1 stars and a maximum of 5 stars. Negotiations are all about giving and taking, but not everybody wants to give or take as much. For some sponsors, their offer is not very negotiable, while other sponsors are okay with changing the terms a bit. Sponsors who are very negotiable have 5 stars, and their opposites only 1. Based on this characteristic, you can always try to ask for more money than they are offering. Every sponsor is in a specific negotiation position, this is expressed by the Power position of the sponsor. The better his negotiation power, the harder they will be to negotiate with. The power position statistic is influenced by whether the sponsor has a contract signed already for the current season, whether they have a contract for next season, what section they are on, and finally how their negotiable stat is. One of the effects that the power position can have is that a sponsor might not be interested in signing for a lower tier division team. The best of the best sponsors in the game will not be interested in signing for a low tier team, while this can change if they aren't signed up with anyone while the season progresses. This means that it's possible that a team is not interested in a team of a certain division, but while their power position lowers this could change so that they are willing to sign a lower division tier team. Every team has 15 sponsorship slots. For each slot, 1 sponsor can be signed. There is a different number of slots per sections, whereas the highest paying section has only 1 slot, and the lowest paying section has 5 slots. 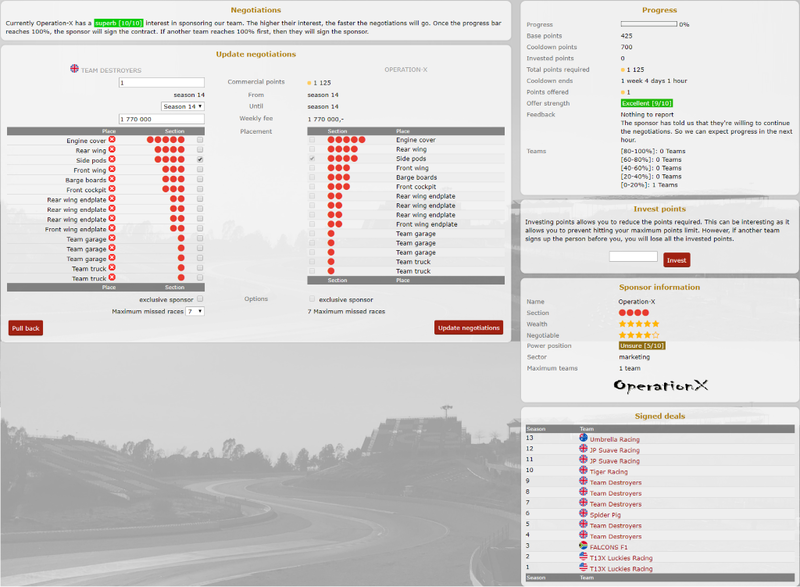 An overview of all the available sections can be found in the Sponsors overview panel. This panel shows you all the sponsors that have already signed a contract with your team, and also the details of that contract. At the very end you can see the most important number - the amount of money they are paying you. This amount of money is paid on a weekly basis, spread out over 24 hours in 7 days. In other words: you are paid every hour your total amount of sponsorship money, divided by 7 and 24. At the top of the table you can see the include negotiations option. If you select that option, then you will also include all the sponsors that you are negotiating with. You can change the week and season as well, to see what the situation will look like in those respective weeks or seasons. The negotiations panel offers you an overview of all the sponsors who you haven't signed up yet, but who you are in negotiations with. It gives you all the details on the last offer you made, and has a button to go back straight away to those negotiations. All the sponsors that are available in the game are listed in the sponsors list. By default only the sponsors that are available to sponsor the current season are shown. This can be changed by selecting the season next to the Available from box. If you select a season there, then you will only see sponsors that are available from that season on to start negotiations with or earlier. It's only possible to approach a sponsor that has only 1 season additional to the current season on their contract remaining. So if you select the current season+2, then you will see a black Negotiate button which implies that it's not possible to approach this sponsor. A red button indicates that our negotiations haven't started yet, while a green button means that we've started negotiations with this sponsor. Sponsors need to be made aware of our team, and we need to catch their eye. That way we will become interesting for them, which is indicated by the Interest column. When you start negotiating with a sponsor the commercials will automatically start to build up the interest parameter of the sponsor, even if the negotiations are not advancing because the sponsor is interested. If you want to build up interest without starting negotiations (because for example this sponsor is not available to be approached yet), then you can do this by clicking the increase button for the sponsor you want to increase relations one level with. Just above the increase button, you can see how many points it will cost to increase the relations one level. The sponsor list also shows you how many teams a sponsor is willing to sponsor and how many teams are negotiating. It is wise to take these into account before negotiating or building interest so you do not waste points when you get beaten to the sponsor. You can view more sponsors for a section by using the "Next" and "Previous" button above the table to take you to a different page. After clicking on the Negotiate button in the Sponsor list panel, you will be taken to the negotiation screen. The negotiations panel shows you basic information about the sponsor. It also reinstates how the system works. It's a race to reach 100% first. Once 100% progress has been reached the sponsor will sign for the team. Once the maximum number of teams are signed, all the negotiations with the other teams are ended and any points invested are lost. This panel is the main negotiations panel. It shows you the conditions of the sponsor, and allows you to fill out your conditions. Important to mention here is that you can fill out the slots you want to offer to the sponsor on the left. The slots that are selected on the right in the placement part is where the sponsor expects to be. If the slot is from the same section, then this will be no problem. If the slot has an exclamation mark or a cross icon, then hover over the icon to see the feedback. Usually this means that this slot has already been offered to another sponsor or supplier, or that you already have a sponsor signed up in this slot. You can set a sponsor to an exclusive sponsor by checking the tick box. Further information about this can be found above. The maximum missed races parameter indicates how many races you can miss before the contract is nullified. If you miss too many races, then the contract will be cancelled automatically. Once you're ready with your offer, you can click Update Negotiations. The sponsor will give you immediate feedback about what they think about the offer and how many points are needed to sign. The better the offer for the sponsor, the less points that are needed to sign them. If the amount of points says "Offer too low" this means that sponsor will not sign with you on the terms you have given. The sponsor will give feedback on what they are not happy with in the Progress section. You can adjust the offer by changing your offer and then clicking Update negotiations. If you have enough points to sign the sponsor then offering that value and clicking Update negotiations will sign the sponsor. Here you can see how far through the signing process you are. The progress percentage bar is calculated by points offered or points available (whichever is lowest) divided by points demanded. The Base points show what the minimum demand that you can spend when all the Cooldown points are removed. The Cooldown points show how many points that have been added to the Base points for the sponsors current demand. These cooldown points will slowly drop every hour once Cooldown ends until there are no more Cooldown points available. Invested points show the total amount of points you have invested into the deal. These will lower the current demand of the sponsor by the amount that you have invested. Total points required shows how many points you need to spend to sign the sponsor now. It is calculated by adding the Base points and Cooldown points together and subtracting the Invested points. The Cooldown ends timer shows you how long until the Cooldown points start dropping. This timer only starts counting down if a team has submitted an offer that the sponsor is happy to sign. This means that once one team has done this, it will apply to every team. It is possible when you are start negotiations that the Cooldown points are already dropping as a team has ended the Cooldown period. Points offered is the number of points you have offered the sponsor in the Update negotiations panel. The feedback will tell you what the sponsor feels about the deal. If the sponsor was unhappy about something, then they will tell you exactly what they are unhappy about. It is not necessary for the sponsor to be completely happy for you to be able to sign a deal with them providing you do not get the "Offer too low" message in the points demand. Finally you can also see the progress of other teams who are negotiating with this sponsor. In this panel you can invest points into the deal. Investing points causes the current demand of the sponsor to drop by the amount you have invested. This is particularly helpful if the demand of the sponsor is above the amount of points that you can store. Once you have invested points, they are immediately taken from your team. If the sponsor has agreed to sponsor the maximum amount of teams that they are willing to sponsor then any invested points will be lost. To invest points, enter the value you wish to invest and then click Invest. The sponsor information panel shows all the information about the sponsor as discussed above along with the company logo. Here you can see a history of the sponsor's deals and which teams they have signed deals with. Sponsors are companies who are willing to offer you money for advertisement space on the car or the garage. It's a vital income stream for teams, and therefore should be handled with a high priority. In this page you can start negotiations with sponsors, and try to increase their interest. [style=text_help_3]Sponsor information[/style] [style=text_help_2]Basic information[/style] Every sponsor has basic information such as a name, a head quarter country and a sector. The first two play absolutely no role game play wise, but the sector can be used to your advantage. The sector implies in which sector the sponsor is active. If you have no other sponsor that has this sector, then you can offer the sponsor to be the exclusive sponsor for this sector. This gives your negotiations a slight boost, and will make your offer more attractive. [style=text_help_2]Section[/style] Sponsors are categorized in 5 rankings called sections. The sponsors from section 5 are only interested in a section 5 spot on your car. Section 4 sponsors are only interested in a section 4 spot or higher. You can always offer an additional lower spot than the minimum that they want, in order to make your offer more appealing. The higher the section, the more points you will need to sign the sponsors to the team. [style=text_help_2]Wealth[/style] Depending on how wealthy the sponsor is, they will offer more money to the team. The sponsor's wealth is expressed in stars with a minimum of 1 stars and a maximum of 5 stars. [style=text_help_2]Negotiable[/style] Negotiations are all about giving and taking, but not everybody wants to give or take as much. For some sponsors, their offer is not very negotiable, while other sponsors are okay with changing the terms a bit. Sponsors who are very negotiable have 5 stars, and their opposites only 1. Based on this characteristic, you can always try to ask for more money than they are offering. [style=text_help_2]Power position[/style] [style=text_help_1]Information[/style] Every sponsor is in a specific negotiation position, this is expressed by the Power position of the sponsor. The better his negotiation power, the harder they will be to negotiate with. The power position statistic is influenced by whether the sponsor has a contract signed already for the current season, whether they have a contract for next season, what section they are on, and finally how their negotiable stat is. [style=text_help_1]Division[/style] One of the effects that the power position can have is that a sponsor might not be interested in signing for a lower tier division team. The best of the best sponsors in the game will not be interested in signing for a low tier team, while this can change if they aren't signed up with anyone while the season progresses. This means that it's possible that a team is not interested in a team of a certain division, but while their power position lowers this could change so that they are willing to sign a lower division tier team. [style=text_help_3]Sponsors overview[/style] Every team has 15 sponsorship slots. For each slot, 1 sponsor can be signed. There is a different number of slots per sections, whereas the highest paying section has only 1 slot, and the lowest paying section has 5 slots. An overview of all the available sections can be found in the Sponsors overview panel. This panel shows you all the sponsors that have already signed a contract with your team, and also the details of that contract. At the very end you can see the most important number - the amount of money they are paying you. This amount of money is paid on a weekly basis, spread out over 24 hours in 7 days. In other words: you are paid every hour your total amount of sponsorship money, divided by 7 and 24. At the top of the table you can see the include negotiations option. If you select that option, then you will also include all the sponsors that you are negotiating with. You can change the week and season as well, to see what the situation will look like in those respective weeks or seasons. [style=text_help_3]Negotiations[/style] The negotiations panel offers you an overview of all the sponsors who you haven't signed up yet, but who you are in negotiations with. It gives you all the details on the last offer you made, and has a button to go back straight away to those negotiations. [style=text_help_3]Sponsor list[/style] All the sponsors that are available in the game are listed in the sponsors list. By default only the sponsors that are available to sponsor the current season are shown. This can be changed by selecting the season next to the Available from box. If you select a season there, then you will only see sponsors that are available from that season on to start negotiations with or earlier. It's only possible to approach a sponsor that has only 1 season additional to the current season on their contract remaining. So if you select the current season+2, then you will see a black Negotiate button which implies that it's not possible to approach this sponsor. A red button indicates that our negotiations haven't started yet, while a green button means that we've started negotiations with this sponsor. Sponsors need to be made aware of our team, and we need to catch their eye. That way we will become interesting for them, which is indicated by the Interest column. When you start negotiating with a sponsor the commercials will automatically start to build up the interest parameter of the sponsor, even if the negotiations are not advancing because the sponsor is interested. If you want to build up interest without starting negotiations (because for example this sponsor is not available to be approached yet), then you can do this by clicking the increase button for the sponsor you want to increase relations one level with. Just above the increase button, you can see how many points it will cost to increase the relations one level. The sponsor list also shows you how many teams a sponsor is willing to sponsor and how many teams are negotiating. It is wise to take these into account before negotiating or building interest so you do not waste points when you get beaten to the sponsor. You can view more sponsors for a section by using the "Next" and "Previous" button above the table to take you to a different page. [style=text_help_3]Negotiate with a sponsor[/style] After clicking on the Negotiate button in the Sponsor list panel, you will be taken to the negotiation screen. [center][img]https://i.imgur.com/UpMcKA3.png[/img][/center] [style=text_help_2]Negotiations[/style] The negotiations panel shows you basic information about the sponsor. It also reinstates how the system works. It's a race to reach 100% first. Once 100% progress has been reached the sponsor will sign for the team. Once the maximum number of teams are signed, all the negotiations with the other teams are ended and any points invested are lost. [style=text_help_2]Update negotiations[/style] This panel is the main negotiations panel. It shows you the conditions of the sponsor, and allows you to fill out your conditions. Important to mention here is that you can fill out the slots you want to offer to the sponsor on the left. The slots that are selected on the right in the placement part is where the sponsor expects to be. If the slot is from the same section, then this will be no problem. If the slot has an exclamation mark or a cross icon, then hover over the icon to see the feedback. Usually this means that this slot has already been offered to another sponsor or supplier, or that you already have a sponsor signed up in this slot. You can set a sponsor to an exclusive sponsor by checking the tick box. Further information about this can be found above. The maximum missed races parameter indicates how many races you can miss before the contract is nullified. If you miss too many races, then the contract will be cancelled automatically. Once you're ready with your offer, you can click Update Negotiations. The sponsor will give you immediate feedback about what they think about the offer and how many points are needed to sign. The better the offer for the sponsor, the less points that are needed to sign them. If the amount of points says "Offer too low" this means that sponsor will not sign with you on the terms you have given. The sponsor will give feedback on what they are not happy with in the Progress section. You can adjust the offer by changing your offer and then clicking Update negotiations. If you have enough points to sign the sponsor then offering that value and clicking Update negotiations will sign the sponsor. [style=text_help_2]Progress[/style] Here you can see how far through the signing process you are. The progress percentage bar is calculated by points offered or points available (whichever is lowest) divided by points demanded. The Base points show what the minimum demand that you can spend when all the Cooldown points are removed. The Cooldown points show how many points that have been added to the Base points for the sponsors current demand. These cooldown points will slowly drop every hour once Cooldown ends until there are no more Cooldown points available. Invested points show the total amount of points you have invested into the deal. These will lower the current demand of the sponsor by the amount that you have invested. Total points required shows how many points you need to spend to sign the sponsor now. It is calculated by adding the Base points and Cooldown points together and subtracting the Invested points. The Cooldown ends timer shows you how long until the Cooldown points start dropping. This timer only starts counting down if a team has submitted an offer that the sponsor is happy to sign. This means that once one team has done this, it will apply to every team. It is possible when you are start negotiations that the Cooldown points are already dropping as a team has ended the Cooldown period. Points offered is the number of points you have offered the sponsor in the Update negotiations panel. The feedback will tell you what the sponsor feels about the deal. If the sponsor was unhappy about something, then they will tell you exactly what they are unhappy about. It is not necessary for the sponsor to be completely happy for you to be able to sign a deal with them providing you do not get the "Offer too low" message in the points demand. Finally you can also see the progress of other teams who are negotiating with this sponsor. [style=text_help_2]Invest points[/style] In this panel you can invest points into the deal. Investing points causes the current demand of the sponsor to drop by the amount you have invested. This is particularly helpful if the demand of the sponsor is above the amount of points that you can store. Once you have invested points, they are immediately taken from your team. If the sponsor has agreed to sponsor the maximum amount of teams that they are willing to sponsor then any invested points will be lost. To invest points, enter the value you wish to invest and then click Invest. [style=text_help_2]Sponsor information[/style] The sponsor information panel shows all the information about the sponsor as discussed above along with the company logo. [style=text_help_2]Signed deals[/style] Here you can see a history of the sponsor's deals and which teams they have signed deals with.